Background & Objective: Hydrogen sulfide [H2S] has been widely known as a toxic gas for more than 300 years in the scientific community. However, the understanding about this small molecule has changed after the discovery of involvement of H2S in physiological and pathological mechanisms in brain. H2S is a third gasotransmitter and neuromodulator after carbon monoxide [CO] and nitric oxide [NO]. H2S plays an important role in memory and cognition by regulating long-term potentiation [LTP] and calcium homeostasis in neuronal cells. The disturbances in endogenous H2S levels and trans-sulfuration pathway have been implicated in neurodegenerative disorders like Alzheimer’s disease, Parkinson disease, stroke and traumatic brain injury. According to the results obtained from various studies, H2S not only behaves as neuromodulator but also is a potent antioxidant, anti-inflammatory and anti-apoptotic molecule suggesting its neuroprotective potential. Conclusion: Recently, there is an increased interest in developing H2S releasing pharmaceuticals to target various neurological disorders. 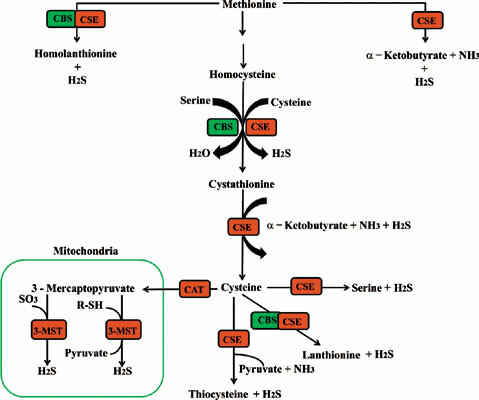 This review covers the information about the involvement of H2S in neurodegenerative diseases, its molecular targets and its role as potential therapeutic molecule. CNS diseases, hydrogen sulfide, molecular targets, neurodegeneration, sulfide donors, therapeutics.